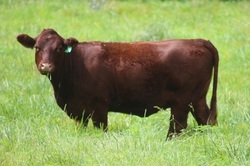 In early 2006 Brookview Farm started its Devon cattle program with the purchase of 15 purebred, registered Devon heifers and one purebred, registered Devon bull (Lakota’s P116). We, like a growing number of cattle breeders, identified the Devon as a well-rounded beef breed that would satisfy our goals as a low input farm, producing a top quality beef on grass forages alone. In our experience, Devons excel in reproductive efficiency, grass conversion and mothering ability. They are a smaller framed animal, with deep bodies producing small vigorous calves that grow rapidly on milk rich with high butterfat content (5.48%; Devon cow Q180 tested 2/8/2008 by the Fayette Co. Extension Agency, Lexington, KY). Perhaps the quality we like the best as a family is the docile, almost friendly nature of the Devon. While this quality endears us to them as a breed, it also has significant value in the quality of the beef they produce in both the purebred Devon and the commercial crossed Devon. As I can testify from my experience with other cattle breeds in both Kentucky and Texas, high strung, nervous animals, whether inherently so or made that way by their environment are neither safe nor fun to be around and the beef from these animals isn’t tender and doesn’t taste good. As a father of two young boys interested in their family farm and curious about cattle, the docility alone is priceless. ​Our primary herd sires at Brookview Farm are Brookview's C91 (Lakota's R104), Lakota’s R104 (Lakota's P60), Brookview's X52 (Lakota's P116) and Brookview's X64 (Tapuwae 635). They have produced daughters and sons that we are very proud of here at the farm and we think their genetics would be a positive influence on any pure Devon or commercial cattle herd out there.